Jewish ghetto of Venice: self guided tour with visits and tastings! Discover the treasures of the charming ghetto of Venice at your own pace. With a practical mini-guide you’ll have the chance to make visits and taste the kosher specialties of Jewish- Venetian cuisine! When you visit Venice one of the points of interest are the jewish ghettos. If you take a jewish ghetto tour venice Italy, you will learn the amazing history of this place and its buildings. This is a fascinating alternative day in Venice and you will learn about the particular culture, traditions and Jewish cuisine, of this, one of the city’s most unusual neighborhoods. Pick up the mini tour guide at the Jewish Museum and start an adventure that will take you to the lesser-known corners of the ghetto. You will visit marvelous synagogues and taste authentic Jewish cuisine, all at your own pace! Through the Jewish Ghetto, you will see how Venice has always been an open multicultural society. You will experience art, history and gastronomy, getting a 360 ° tour of Jewish culture! Three of the five synagogues in the Venetian Ghetto can be visited, while the other two synagogues are used for worship. When you arrive in the ghetto, you will not be able to identify them immediately. 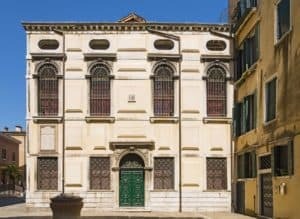 Unlike the places of worship of other religions, the synagogues of Venice do not have an obvious entrance they are concealed behind the rest of the apartments!. During the tour you will learn how to read the ghetto and decode its symbols and elements like a kind of registered trademark. This will allow you to understand Jewish cultural customs and traditions through this particular key to the history of Venice. In the serenissima of Venice, the Jewish Ghetto and Giudecca are the places most closely associated with the presence of the Jewish community in the lagoon. In particular, the Ghetto is a place that attracts more and more visitors and is a fascinating way to discover the relationship between Venice and different peoples. The Jewish presence was one of the first to be recognized by the Republic of Venice and the Ghetto, the oldest in Europe, was founded 500 years ago. 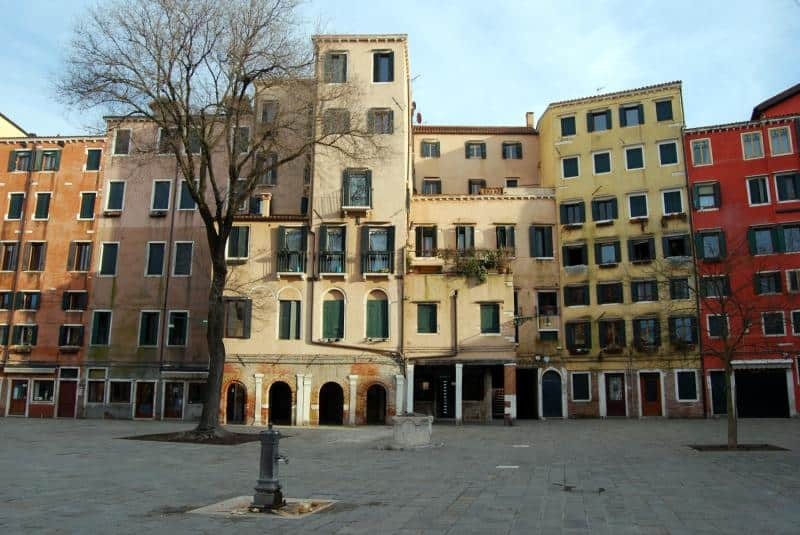 The mini-guide gives you a way to discover the different parts of the Venetian Ghetto for yourself. Although it is a small area of ​​the city, it is possible to distinguish different buildings and details from different historical periods. Today we distinguish between Ghetto Vecchio, the new ghetto and a very new ghetto. The heart of the Ghetto is Campo del Gheto Novo, which overlooks the Jewish Museum, the Banco Rosso (one of the ancient pawnshops that were active in Venice) and the Jewish Retirement Home. The Ghetto is an area of the Cannaregio sestiere of Venice, divided into the Ghetto Nuovo (“New Ghetto”), and the adjacent Ghetto Vecchio (“Old Ghetto”). 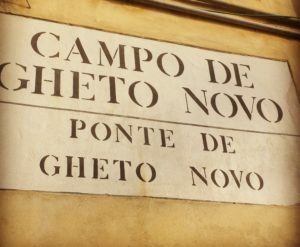 These names of the ghetto sections are misleading, as they refer to an older and newer site at the time of their use: in terms of Jewish residence, the Ghetto Nuovo is actually older than the Ghetto Vecchio. The ghetto was connected to the rest of the city by two bridges that were only open during the day. Though it was home to a large number of Jews, the population living in the Venetian Ghetto never became a distinct “Venetian Jewish” ethnicity. Four of the five synagogues were clearly divided according to ethnic identity: separate synagogues existed for the German , Italian, Spanish and Portuguese and LevantineSephardi communities. 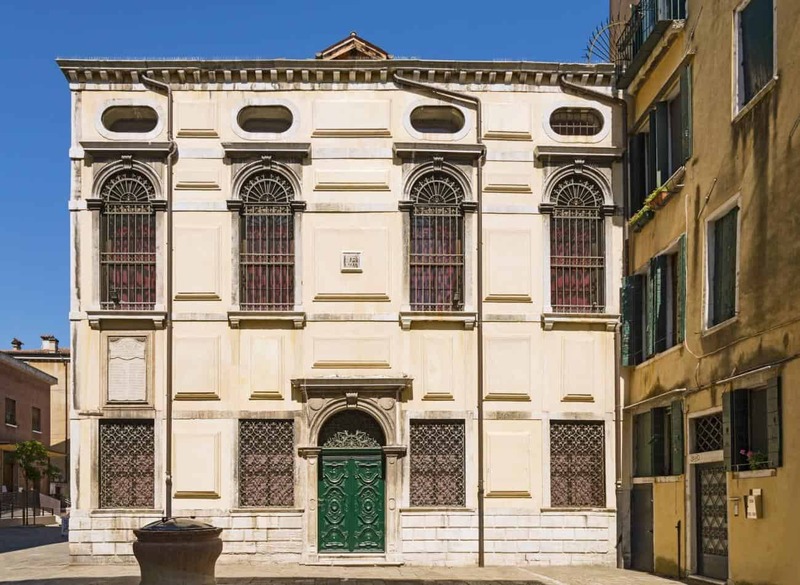 The fifth, the Scuola Canton, ws built as a private synagogue for the four families, one of them the Fano family, who funded its construction, and also served the Venetian Ashkenazi community. Today, there are also other populations of Ashkenazic Jews in Venice, mainly Lubavitchers who operate a kosher food store, a yeshiva, and a Chabad synagogue. Miniguide of the Jewish Ghetto as a gift. A visit to three Synagogues with an accredited guide to get to know the spiritual and artistic heart of the Ghetto. 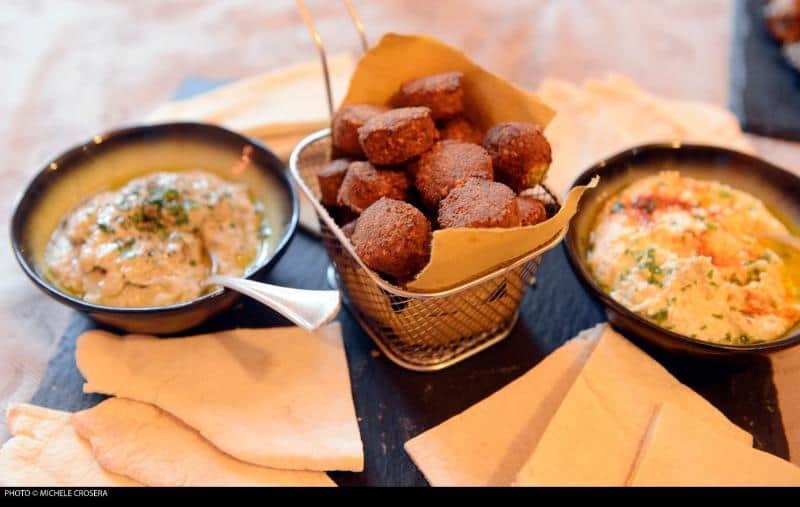 The convivial moment of L’Chaim !, Jewish toast that means “To life!”, With Prosecco and cicchetto (eg falafel with hummus), for children accompanied by soft drink. An option: you can order a tasting menu with specialties of Jewish-Venetian cuisine. The menu will be accompanied by wine and each dish will be strictly kosher certified by the Rabbi of the Community of Venice. The tour is available all year round by reservation, at least 48-72 hours in advance. It is not held on Saturdays and on Jewish holidays. On Fridays, afternoon activities may close early in view of the shabbat and the last visit to the synagogues is held at 2.30pm. The itinerary starts at the Jewish Museum, in Campo del Gheto Novo, where you can pick up your mini-guide. The Jewish museum has several stairways and unfortunately does not have a lift. Therefore, the visit may not be very accessible for people with disabilities. We invite you to contact us for more information and directions for the tour. 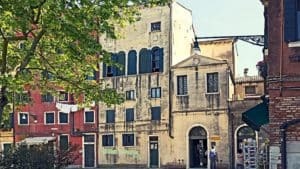 The Mini-Guide of the Venice ghetto is presented by Venice beyond the Ghetto, the Jewish Museum of Venice – CoopCulture and VivoVenetia. Where is the Jewish Quarter in Venice? The Ghetto of Venice is located in the Cannaregio district, about 5 minutes walk from the Santa Lucia train station. Coming from the station you can access it by crossing Ponte delle Guglie and turning immediately left into Fondamenta San Giobbe. After about 50 meters you will take the Sotoportego del Ghetto, on the right. 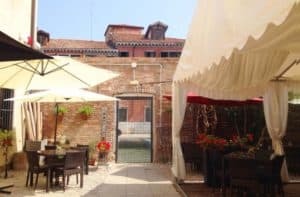 It is also possible to enter the Ghetto from Fondamenta degli Ormesini, a place of lively nightlife and very recommended for an evening aperitif. From the Fondamenta you cross the iron bridge that leads to Campo del Gheto novo. The Venice ghetto is also well connected to ACTV water buses. The nearest stops are “Guglie” and “San Marcuola”, the latter is on the Grand Canal. The Jewish Ghetto of Venice is a small but fascinating world to be discovered. Here are some further tours where you can find out about history and stories that will intrigue you. Ghetto of Venice visits: Tour The Chaim special every second Sunday of the month! Collective guided visit of three Synagogues, spiritual and artistic heart of the Ghetto (the visits start at minute 30, each hour). 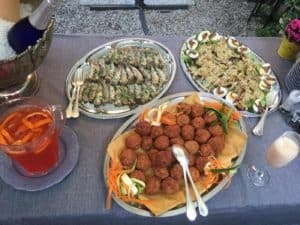 Optional: a tasting of Jewish-Venetian cuisine, accompanied by local wine, all strictly kosher certified by the Rabbi of the Community of Venice. The offer is valid in case of rain as well. For cancellations up to 48 hours prior to departure, 50% of the price will be retained. In case of subsequent cancellation and in case of NO SHOW, that is the lack of presence at the agreed time and place, no refund will be issued. – The itinerary starts from the Jewish Museum, in Campo del Gheto Novo. By showing your voucher at the ticket stand, you will know of the next tours of the synagogues that are available to join. – Because of the presence of many stairs, unfortunatly the tour cannot be reccommended to people with limited mobility.